I started crocheting hexagons this week. I think they'll become a blanket for our bed. I don't normally start making blankets in the spring, but I figure I'm going to need hundreds of these hexagons to make a blanket, so I can spend the warm months making them and the cold ones turning them into a blanket. I think I'm join them with cream-colored yarn. I'm envisioning something like a paintbox. The colors are soft, meant to coordinate with our duvet set. I plan to add more colors, some warmer ones like gold and rust, as well as greens and purple, maybe brown and tan. I'm using DK acrylic yarns, several brands, lots of loose ends and small bits. It's a great stash-buster. Now I just need to stop buying yarn. I love crochet for many reasons, but one stands out above all the rest: it keeps me busy. I love to read and write, but when I'm truly frazzled, nothing else can comfort me the way crochet or stitching does. I spend plenty of time in unproductive ways too, don't get me wrong, but I find that everything in my world works better when my hands are busy. Other people notice it too; the Bear always knows when I'm in between projects. I'm different: I fidget, I talk too fast, I pick at my nails, I eat too much. You could say that I'm in withdrawal. Handwork is a balm to my soul. This week was difficult, with the Bear traveling for work and all the normal daily-life stuff falling to me and the extra worry and stress of the LB's medical stuff. I haven't had much time for blogs or Instagram this week; I've been feeling a little low and keeping to myself. The LB had a test on Wednesday morning. We had to be at the hospital early; a neighbor who is also a friend took the GB to school for me. Thank goodness for friends. After the test, I had him sit down in the lobby for a snack (I'd brought juice and a cereal bar with me). An elderly woman commented on the bandage he had on his arm (he'd had an IV during the test). She told us she was there for brain surgery, on a benign tumor taking up a large portion of her brain. She was remarkably calm. I noticed she had a bag on the chair next to her, with yarn and knitting needles inside. She was prepared to knit while she waited for her brain surgery. I was alarmed and touched and inspired all at the same time. I wondered if she would be able to knit again soon after the surgery. I hope it helps her heal. I've only made a small start on these hexagons but I felt their power this week. I felt better about everything in the afternoons when I sat down to crochet, with the radio on and the windows open to the breeze. I'm glad to have this kind of work to do. It's fulfilling and centering. I love having beautiful handmade things to admire, of course, but the work itself - the emotional satisfaction and soothing nature of it, the way it girds me and grounds me - is by far the best thing about making creative handwork a part of my life. I so know what you mean. For months now I've been hoping from hospital to hospital with both my mum and son because they both needed surgery. Everywhere we went my knitting and crochet bag came too. It made me calmer and waiting times am awful lot shorter. It was a real life saver for me during these worrying months. I really do hope that your son's health improves soon. It must be such a hard time for you. I agree with you, handwork is a real therapy. Doing some knit or crochet is so good when you are in stress period or worry about something. enjoy every good moments you can have. So true, I too find that I need something to quietly sit and do, especially the last few years when my health has not been so good. I often think how hard it must be to be blind. I do hope that you are given strength for each day, especially the difficult ones and that all turns out well with LB and you all. They say that yarncrafting has health benefits and I'm sure it does, we can look at ourselves, as you have done here, and see what a difference it makes to us. Your hexagons are lovely, such pretty colours, and it will be a portable project for you this summer before you have to start joining them together. I hope the results from your son's tests are what you want to hear, sending lots of hugs. I get your need to have busy hands. I think we all find the medium that soothes us. I am glad that you have found yours and that it has bought you comfort during your busy week. Ah, yes. Crochet is such a wonderful therapy! What did I ever do without it? I love your little hexies and the colors in your duvet. They look great together. I've started a big hexie project too. I'm giving myself plenty of time, even weeks or months, to do it. It's so much more fun that way. You don't want the therapy to turn into just another stress-maker, right? Hope you have a relaxing weekend! Yarn is so therapeutic is it not? I will send that woman some positive thoughts and some for you and your son. I know that medical issues can take such a toll, especially on the Mom who tends to carry all this around with her. 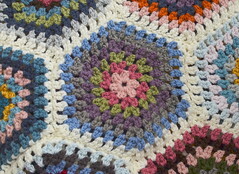 I love the colours of your crochet, your blanket will look stunning on your bed, a perfect match! I wish you a peaceful and happy weekend. I love this idea. And I really love those colors you chose. I think I may try my hand at crochet again one of these days. I've been completely hooked on Call the Midwife and have fallen in love with the blanket that they made together! I can imagine finishing a large blanket feels amazing, can't wait to see yours. Have a great weekend. Your hexagons are so pretty and the colors are soothing. It'll be a pretty blanket. I agree, working with your hands is soothing. Oh, so pretty! Reminds me of my English paper piecing. I love the pretty colours of your hexagons and will make a beautiful quilt. My thoughts and prayers are with your little boy and the lady you met. I always found it nice to have some knitting to do when I feel stressed and just seems to calm one down having your hands busy. A beautiful blend of colours in your hexagons, Jennifer. 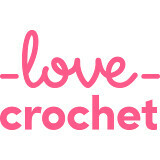 It is amazing how soothing crotchet, knitting or hand sewing can be, as many of us have found. I feel lost without something to pick up and occupy my hands when I need a bit of 'time out'. It is such a worry when children have medical needs - all the very best to you all. I hope your LB' s test went okey and he's fine. It is wonderful to be able to make things through crafting. You have nice, handmade things as a result but the making process also gives enjoyment and satisfaction. Crafting can be therapy, it is good for the soul. Sorry, I meant hexies, not hexagonal. I know exactly what you mean about between project fidgetiness. And about handwork grounding you. I do hope all is well now with you and yours and your family is back to its normal routines. I didn't take any craft with me to London this week, and it was only when I sat down last night and worked a few rows of my granny stripe that I realised how much I had actually missed it! And no wifi either... no wonder I was in bed and asleep by 11 most nights! This post has really moved me. I can't put my finger on why, but I've just sat and scribbled loads of stuff down in my journal. 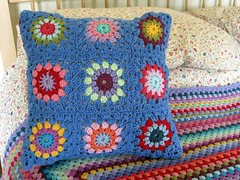 The crafts like crochet, knitting and cross stitch etc are great for calming us. Love our hexagons by the way.